New satellite imagery shows that Iran’s mock-up aircraft carrier was not destroyed during naval exercises but was towed back to Bandar Abbas. Imagery captured in mid-March shows what Western sources have called a “barge” berthed at the naval base with extensive damage visible to the deck. The 16 mock aircraft previously visible on handhelds and satellite imagery were nowhere to be found. The mock-up returned to its previous position at 27.141731 56.201896 where it was observed in late January during mobilization. During the Great Prophet 9 exercises Iran targeted the vessel with a range of offensive equipment including swarms of fast attack craft, anti-ship missiles and ballistic missiles. Strikes were reportedly launched from both Bandar Abbas and Jask. Phase 2 of the exercise saw Iranian Special Forces fast-rope from helicopters onto the barge surface and attack the mock-up’s superstructure. A final wave included targeting by a suicide vessel and a coastal cruise missile. The whole show was an important propaganda piece demonstrating Iran’s anti-access/area denial strategy fitted to Iran’s unique operating space. “We are sending all the Persian Gulf countries a message of the might of the Islamic Republic of Iran — a message of security and peace in the Persian Gulf region and the Strait of Hormuz,” commented Mohammad Ali Jafari, commander of the Iran’s Revolutionary Guard Corps, the force responsible for security of the Strait. Iran also boasted to have had more than 400 “shells” hit the mock-up during the exercise within a 15 minute period, according to domestic reporting translated by Memri. However not surprisingly, Iran’s firepower failed to sink the barge which is largely due to the way it was constructed. Historical satellite imagery from August 2013 shows that Iran built a hollow shell on a lattice structure—the latter similar to material used to build Iran’s offshore oil platforms. As a result, there was very little solid structure to actually strike and sink. At this point, it’s still difficult to say what Iran has in store for the mock-up. It seems likely Iran may eventually drag this thing back to the ISOICO shipyard, repair the damage and use it again in future exercises. 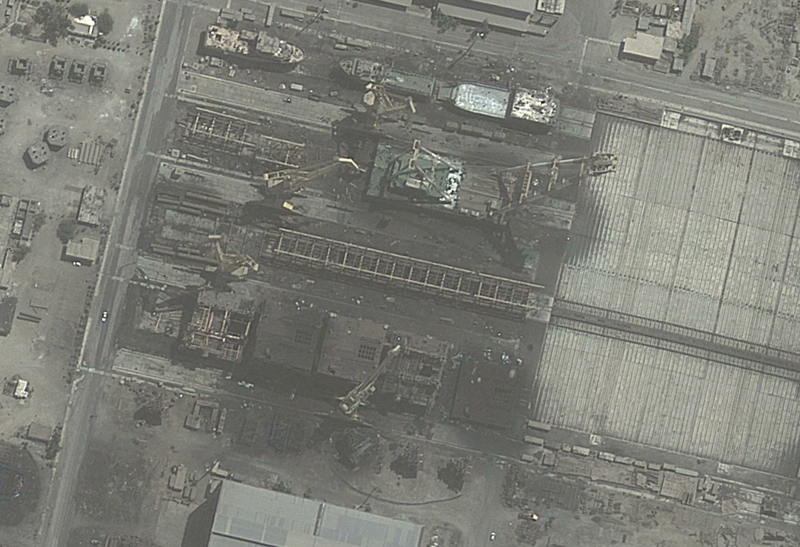 With the recent addition of two new dry docks, Iran isn’t running short of any space for repairs. It was an excercise kids. We do exercises all the time. Also, the point of the excercise was not to sink the ship. That would be a mess to clean up that’s why they created a hollow carrier with specific designs not to sink. no war happens. iran, Russia china and india and few other countries will join efforts and ward off themselves against endless greed, bloodthirst and treachery of ruling Zionist governing US to create a new multipolar world. world will be more just place to live if two counter balancing power rule it even if both sides be unjust. then humanity will elevate to a higher stage of civilisation. For shure it was an exercise, obvious. I agree, it was not the purpose to sink that barge. But, and that was my point in laying out some of my thoughts, what was the purpose of that exercise? @all the proud “kids” on both sides. This exercise was nothing else than a try to arouse attention. It was not an indicator, that Iran has made progress in getting anti carrier strike group capabilities. It was a show of force, at least one that could be presented to the Iranian people. Otherwise, the conclusion that Iran has no capabilities of threatening a CSG is a incorrect as well. So big excitement on both sides based on this carrier mock up exercise story is clearly unfounded. Well, before the exercise the ‘aircraft carrier’ was filled with fake fighter aircraft. Afterwards they were all gone. My guess the goal was to practice strafing an aircraft carrier in order to destroy the flight deck and planes. The reality is that the U.S. Navy would destroy much of the Iranian fleet in short order. Would the U.S. suffer damages and casualties? Yes. Would Iran have a standing navy afterwards? No. It would be at the bottom of the Arabian Sea where it belongs. The Iranians talk a lot of smack about most things. It is the Muslim way. That said, I don’t think we underestimate them. If they believe that running this exercise is going to equip them to sink a US aircraft carrier, they are deluding themselves. All their efforts seemed to have gone into sinking the mockup with no thought as to how the protective screen will prosecute any metallic object with bearing movement to the fullest extent of their military capability. Ships crews using radar, sonar, visual, IR, ESM and ECM will be on high alert, these ships being armed with guns, SS and SA missiles. These videos are meant for local consumption, the government attempting to make the Iranian public believe that they have the capability just because they can attack a floating shell that looks like an aircraft carrier. Any attempt to attack a real aircraft carrier will result in a lot of Iranians lying dead at the bottom of the sea and in amongst the ruins of their command and control bunkers. A Gilbert and Sullivan naval theatre of the absurd, both in terms of the building of the mock carrier and the responses to it.